Fredericksburg  is a city nearly half way between Washington, D.C., and Richmond, Virginia. Fredericksburg was founded in colonial era as a "port city" on the Rappahannock River--the fifth longest river in Virginia. At the time, it was at the farthest point navigable by large ships trading goods with the Old World. Although the city became a key trading center for the plantation owners and farmers nearby, it never achieved the level of commerce enjoyed by Richmond and Alexandria. The city was contested during the American Civil War, changing hands numerous times between Union and Confederate forces. The most famous battle in Fredericksburg saw Union General Burnside repeatedly march thousands of his troops across the Rappahannock River and up Marye's Heights to their doom. In recent years, Fredericksburg's population and surrounding communities have boomed as housing costs closer to Washington, DC forced commuters to seek neighborhoods farther out. Many living in Fredericksburg drive up to two hours or catch the VRE commuter rail to work in DC. Fredericksburg is also a popular home for military families employed by the nearby Quantico Marine and Dahlgren Naval bases. One Amtrak train station serves Fredericksburg at Caroline St. and Lafayette Blvd., which is a stop for Amtrak's Carolinian and Piedmont and Regional trains. The Virginia Railway Express  runs commuter trains between Fredericksburg's Amtrak station and Union Station in Washington, DC on weekdays from 5:15am to 8:25pm. The trip from DC takes approximately an hour and a half, depending on freight train schedules (the railway is shared with CSX) and track work. A single ticket from Union Station is $8.80 and discounts are offered for Ten Trip, Five Day, and Monthly passes. VRE does not run on Federal holidays but does run special service on Independence Day. Fredericksburg is about fifty miles south of Washington D.C. located directly on Interstate 95 at exit 130. It is also one hour north of Richmond on Interstate 95. Travel time from the north (Washington, DC) will vary due to traffic conditions (avoid rush hour). Between 2:30PM and 7:00PM, typical travel times to Fredericksburg are from an hour and a half to two and a half hours. Alternative routes include taking either State Highway 28 through Manassas to US Route 17, or by taking US Route 29 through Warrenton to US Route 17. Both routes take about an hour and a half, but the traffic is much more bearable and most of the trip consists of rural driving at full speed. This way takes about one and a half hours, but you avoid the stop-and-go traffic from the mixing bowl (I-95/I-495 interchange) all the way to the HOV merge (just south of the Dumfries/Triangle Exit). You also avoid the bottleneck on Hwy 123 at Occoquan. Joplin Road is especially fun as the road is very windy and hilly. It runs between Prince William Forest Park and the Quantico Marine base. Downtown Fredericksburg is a walking city - the sidewalks are wide, inviting, and mostly paved in brick. Many locals frequent the streets as well as the occasional street musician. Biking downtown can be fun, but stay off the sidewalks and be sure to follow the traffic laws. Driving is a good option. Downtown roads are largely straightforward aside from some non-standard intersections and one-way streets; outside the city numerous signs point to places of interest and major through ways. If possible, avoid driving during rush hour as traffic is intolerable, especially on I-95, US-1, Hwy-3, and US-17. There is plenty of free parking downtown, either on the street or in the many public lots (PDF map available here: ). During normal business hours (8AM-5PM), much of the street parking has a two-hour time limit, after which cars will be ticketed. A city parking garage is located at 600 Sophia Street, parking there is free for the first two hours. After that, the rates vary, but they are roughly $1 per hour, $8 or less per day (full details at the Fredericksburg city website ). 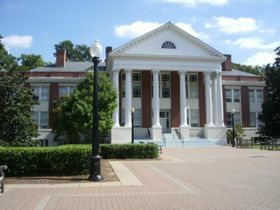 The University of Mary Washington is a small liberal arts college located near Downtown Fredericksburg. It has been voted, in the past, as one of the most beautiful college campuses in the United States, according to the Princeton Review. Its architecture is comparable to that of the University of Virginia. 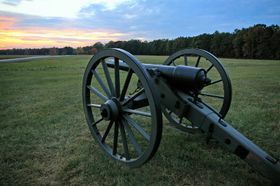 The Fredericksburg Battlefield  was the site of a key battle during the American Civil War. You can visit, for example, the infamous Marye's Heights. Just outside the city, 3 other large major battlefields to see; Chancellorsville:Lee's "masterpiece" and where the great Stonewall Jackson fell in battle; The Wilderness: known for its brutal fighting in some of the most dense forrest and thicket in Virginia; Spotsylvania Courthouse; known for its 2 week long bloodly stalemate on Grants march to Richmond in 1864. The Kenmore Plantation is a Georgian mansion once occupied by Fielding Lewis and Betty Washington Lewis, George Washington's sister. The Mary Washington House is a short walk from Kenmore. A small frame structure, it was purchased by George Washington in 1772 for his mother, Mary Ball Washington. Of interest is the garden now maintained by a volunteer group of certified Master Gardeners. A huge crepe myrtle is thought to have been planted by Mary herself. The Hugh Mercer Apothecary is a restored 18th century pharmacy located on Caroline St. in downtown. Take a tour, the guides are dressed in period attire and take you through the building explaining 18th century medicine and local history. Belmont/Gari Melchers Museum is a great little estate near the Rappahannock. Impressionist painter Gari Melchers lived here. The estate is very well maintained and features beautiful gardens and a separate art gallery where many of his works are on display. Guided tours of the mansion are also available. Ferry Farm was George Washington's boyhood home. Chatham (pronounced, "chat-um") is a Civil War-era mansion that overlooks the Rappahannock where Union soldiers crossed at the battle of Fredericksburg. It also provides a great view of the city itself. Take US-17 or US-1 to River Road, or cross the Hwy 3 bridge from downtown Fredericksburg and make a left when you see the sign. Lower Caroline Street is a long block of privately owned homes built between the late 18th and early 20th centuries. Some still contain shell fragments from the battle of Fredericksburg. Canoeing or Kayaking on the Rappahannock River. Be aware that the river can be very dangerous if you are not careful. There has been some 70 or so drownings since the early 1960's. It is not unheard of at least one or two drownings to occur along the river each year. Therefore, if you decide to go adventure on the Rappahannock River, be sure to check out the safety information and water levels before you begin your adventure. Hiking along the Rappahannock River near Francis Thornton's Mill just off of Riverside Drive on the south bank of the river, upstream of the US-1 bridge. It is also possible to hike up along the canal to where the old Embrey Dam used to be. There are a network of hiking/biking trails all the way up along the river, well past the I-95 bridge. Beware when hiking through the quarry, that there are "No Trespassing" signs posted. As tempting as it would be on a hot day, do not swim in the quarry, lest you want to run the risk of meeting Frederiskburg's Finest. If merely hiking through the area, it is unlikely you'll be hassled, however. If you hike up the river far enough, you may be able to get a glimpse of some of the old canal locks. Golfing at any of the several nearby golf courses, such as Meadow Farms, Cannon Ridge, or Lees Hill. Central Park has numerous large department stores, mentioned earlier. It also has some notable small shops, such as Pier One Imports (located near Route 3) and several clothing vendors. The Spotsylvania Towne Centre has more department stores, like Sears and JCPenny, along with numerous smaller stores as well. The Stafford Marketplace, located near the Garrisonville/Aquia exit on I-95 (the Target is visible from the highway itself), about 10 minutes north of Fredericksburg, is a quieter, less frequented and newer shopping establishment. It also contains Bed Bath & Beyond, Kohl's and Best Buy, but fewer stores overall. There is also a Wal-Mart nearby. 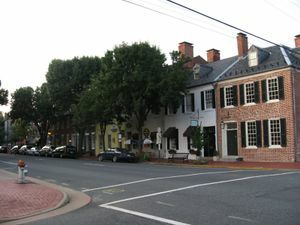 There are numerous small shops scattered throughout the city of Fredericksburg, especially in the downtown area. Antique shops are especially common, and there are a few nice used bookstores too. Crown Jewelers has a good reputation in the area for their service and quality of jewelry and other trinkets. Central Park contains many notable (if not generic) chain eateries, including Panera Bread (with free wireless internet), Chipotle, Bonefish Grill, Olive Garden, A&W, Long John Silver's, TGI Friday's, Applebee's, Ruby Tuesday's, Joe's Crab Shack, Melting Pot, and many more. The Stafford Marketplace has a few places to eat, most notably another Panera Bread (also with free wireless internet), and other generic chains. In addition to these places in the mall and lifestyle center itself, the adjoining Paragon Village 12/Splitsville also includes some excellent dinning options, especially if you are also interested in seeing a movie or going bowling. For example, some movies, with a small extra fee (about $5 on top of the regular movie ticket) grants access to the upstairs Chatterbox VIP lounge and bar. They actually have some really good food up there (beyond the typical movie theater fare), plus you can take your drink into the movie itself. Those seats are really nice up there as well. This area is for 21 and up only, thus a great way to see a movie and get dinner without having to deal with any obnoxious teenagers. Downtown Fredericksburg may not be huge, but due to the presence of a college and a fun-loving local crowd from both the city and the surrounding counties, it does have a good number of decent places to catch a drink. Catering to those who want a relatively low-key atmosphere to catch up with friends and to those who simply want to let loose and get drunk, there should be something for everyone. A good route for a downtown bar crawl: start at Capitol Ale House for some good beers and burgers; hit Spirit's for a can of PBR; stop by J. Brian's for a pint of Guinness; then check the scene at FW Sullivan's, Brock's or The Colonial Tavern, and stop in if they're hopping and let loose. The Holiday Inn Select and Hilton Garden Inn are mid-range hotels located in or near Central Park. There is also a Ramada Inn across Route 3; it is a budget establishment. Days Inn is located across US-1 from the Stafford Marketplace. If you take the US-17 exit (Exit 133) from I-95, you will see numerous hotels, restaurants, stores, and gas stations, including a Holiday Inn and Howard Johnson Inn. Ramada South Fredericksburg, 5324 Jefferson Davis Hwy, +1 540-898-1102, . Ramada Spotsylvania Towne Center Mall, 2802 Plank Road, +1 540-786-8361, . 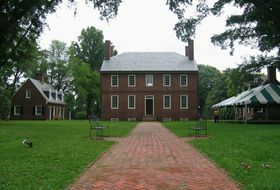 George Washington's boyhood home, Ferry Farm, is located across the river in Stafford county. Many other sites of historical interest are a short drive away, including Spotsylvania Courthouse. Lake Anna is about 20 miles or so outside of town, which is a popular boating and fishing destination. The Lake Anna State Park features some 15 miles of hiking trails, a beach on the lake itself, as well as picnic areas. Camping has also been recently added. A trip down to Kings Dominion, which is a large theme park a mere 35 miles to the south along I-95, is worth a day to see and experience. In decent traffic, it takes around a half an hour to get there from Fredericksburg. The park features many roller coasters and other rides, including some world class rides such as Volcano : The Blast Coaster and the Dominator. About 20 miles to the north along I-95 is the awesome National Marine Corps Museum near the Quantico Marine Corps Base. This museum features all kinds of interactive displays detailing the history and evolution of the United States Marine Corps. For those that love to shop, Potomac Mills, one of the largest outlet malls in the country is only about 1/2 hour or so to the north (assuming decent traffic). There are more than 220 outlet stores in this place, so all kinds of options for the shopping fanatic. There are also several restaurants as well as an 18-screen movie theater. About and hour and half west of town is the Shenandoah National Park, which includes over 500 miles of hiking trails, as well as camping. If you are not the hiking nor camping type, at the very least, a drive down Skyline Drive can be worthwhile to check out some of the incredible views. Be warned that in the fall, during the peak of the fall colors (later part of October to the first part of November), this can get pretty crowded.